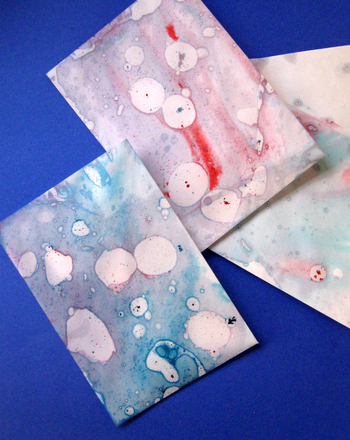 Swirling colors, bright patterns and unexpected results are what you get when you marbleize paper.This art form is old and steeped in tradition (you may have seen endpapers in very old books). 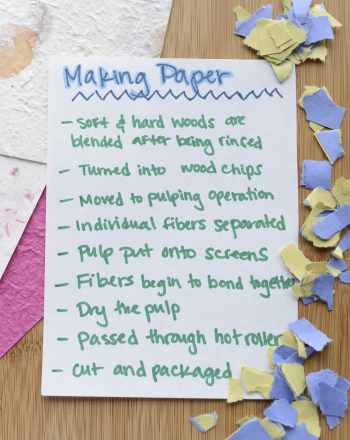 Making marbleized paper, however, is a bit messy and should be done outside if at all possible. If you can't do it outside, make sure you do it in a room where the floor and work surface is covered. 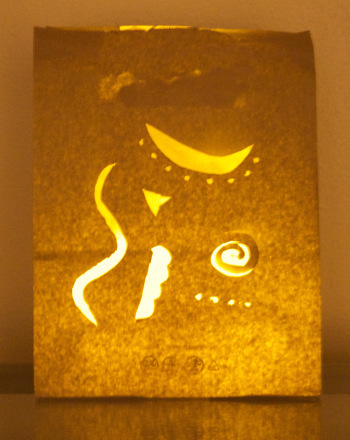 The beautiful result of this project is well worth the extra effort! 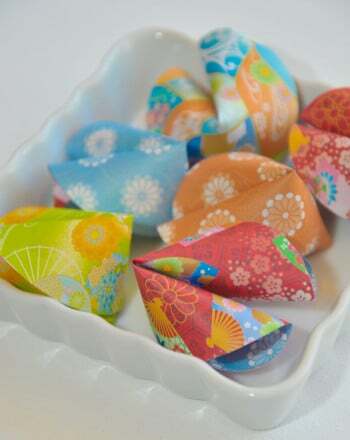 Fill several paper cups about 1/3 full with cooking oil and add several drops of food coloring. Stir them thoroughly with a craft stick. Fill your tray with about 1 inch of water. With your dropper add a few drops of colour to your water. Gently swirl the colour around until you like the pattern. Make sure you do not mix the colour into the water, you want it to sit on the surface. When you have a pattern that you like, carefully place your paper so it lies on top of the water without any air bubbles under it. 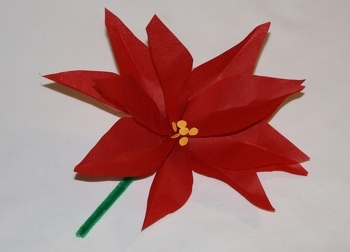 Lift the paper off immediately and let it drip for a minute. 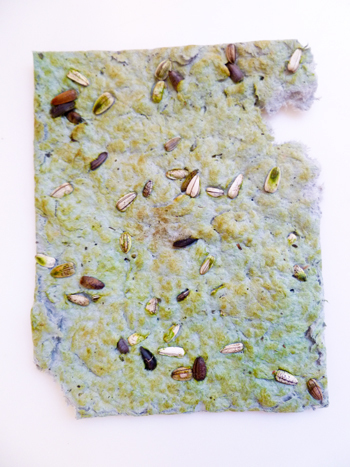 Hang the paper on a clothes line, a drying rack or a flat surface to dry. Gently stir the surface of the paint in the tray, or add some new colors and swirl them. practise patterns like circles, hearts and squiggles. Don't worry about mistakes because it will all beautiful! Marbleized paper started over 700 years ago in Turkey. They used it in government papers to keep people from forging documents. A good question to consider is why the oil doesn't mix with the water and why it floats. Oil is a different substance and molecular charge than water and therefore cannot dissolve into the water. Oil is less dense than water and so it floats to the top. 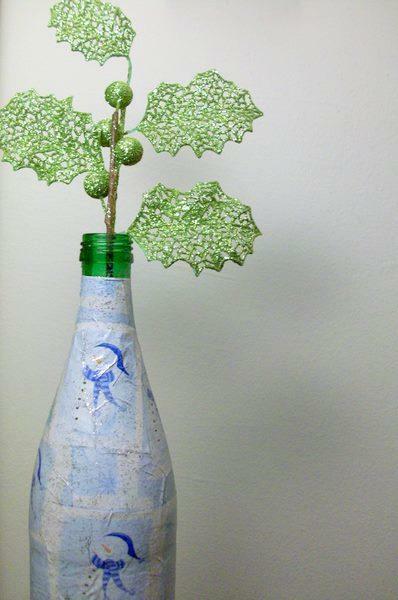 Your child can re-use and re-purpose old seeds and paper into something new: decorated paper that can be planted! 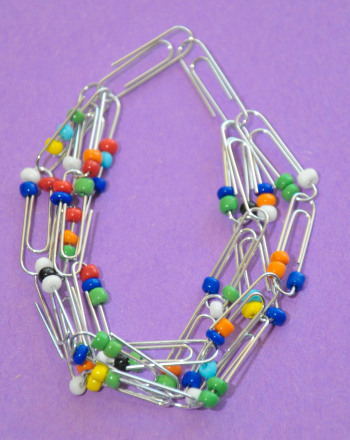 Transform ordinary metal paper clips into wearable jewelry by adding beads and linking the clips together.